A perfect traditional Greek pork chop, called brizola in Greece, is crunchy on the outside and juicy on the inside. This recipe delivers just that. The trick is in the marinade and in using bone-in chops. The bones help the chops retain their moisture during the cooking process. If you don't like pork chops or just want to try another protein, the marinade also works very well with chicken. Follow the same steps and use the marinade for chicken thighs, breasts, or a variety of parts. Once you grill your meat, add a side of fried potatoes and or a big Greek salad to finish the meal off. Do note that the recipe calls for the chops to be marinated for at least an hour (longer is better). Plan ahead. If you are grilling for dinner, you could make the marinade in the morning and let the chops soak up the tasty flavors all day long. Whisk the marinade ingredients in a bowl: olive oil, Worcestershire sauce, lemon juice, garlic, oregano, salt, and pepper. Place the chops in a shallow pan or other non-reactive container. Pour the marinade over the chops. Cover with plastic wrap and chill for at least one hour. Longer is better. Grill over medium-high heat until the chops reach your desired degree of doneness. Allow the chops to rest for 5 to 10 minutes before cutting into them. Give the chops a sprinkle of coarse salt and a squeeze or two of lemon juice prior to serving. Red wine vinegar can be used in place of the Worcestershire if you prefer a somewhat milder marinade. Some traditional recipes call for one chopped red onion in the marinade as well. Chops usually take about 6 to 7 minutes per side, but cooking times will vary. 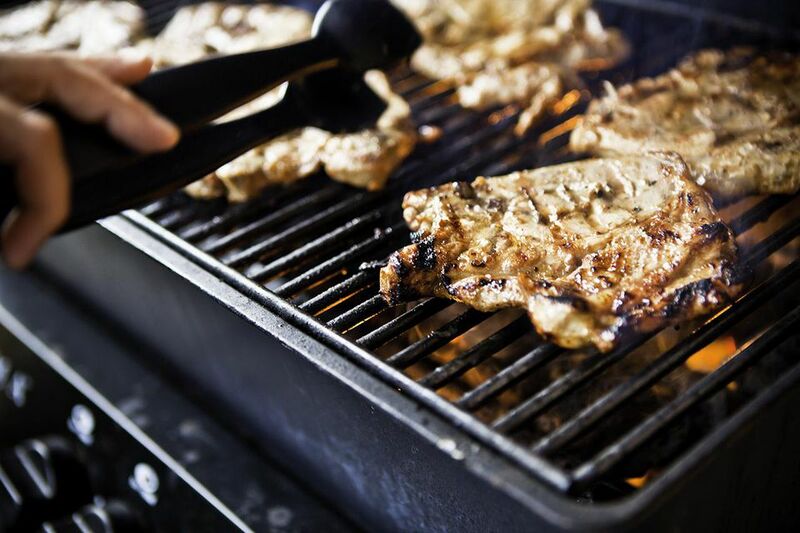 If you know your grill, you probably have a good feel for how long the chops must cook to turn out the way you like them, but keep in mind that pork cooks more quickly than beef and is very easy to overcook. This could turn your culinary masterpiece into a chewy, dried-out mess. If you're unsure, err on the side of less time, not more. Alternatively, you can sear the chops first, then finish them off in the oven. Either way, a thermometer inserted into the thickest part of the chop should read no less than 145 F.
Allowing the chops to rest for a bit before cutting helps them retain their moisture. Remember, they're still cooking internally even after they're removed from the heat source. If you cut too soon and the juices escape, this will result in dry meat as well.